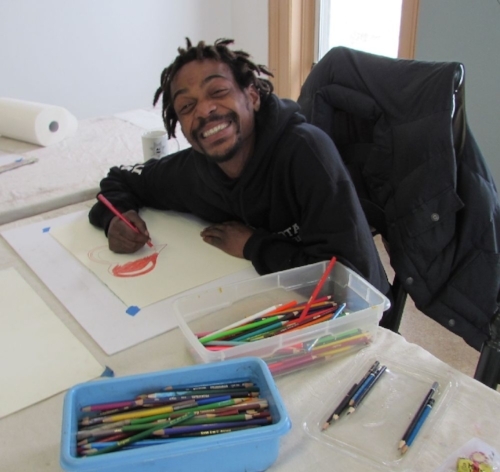 Richmond Futch, Jr. working along side Ty, a gifted illustrator and artist in transition. Every Wednesday, in the “Upper Room” of Saint Joseph’s House of Hospitality, beauty happens. Men and women gather at tables covered with pastels, pencils and paints. Leaving the chaos of the outside world, one at a time they select a new crisp sheet of paper filled with possibilities. Soft sounds of flutes and jazz fill the sunlit studio creating a serenity not easily found on the city streets. This Revelation Artist is all about color. Lots and lots of color! Their work is imaginative, colorful and often compelling. Children, flowers, and graphics leap off each artist’s page. By providing a space to explore creatively, the artists become introspective and while doing so share life experiences with one another. Laughter replaces solemnity and calm replaces angst. The extraordinary artwork created is a wonderful result of this confluence of human emotion and engagement. It is for these reasons that the mutli-faceted project, Revelation Arts, exists. Revealing the Artist Within Workshops are held every Wednesday morning from 9:30-12:30 at St.Joseph's House of Hospitality 402 South Ave, Rochester, NY 14620 . The workshops and materials are free for all participants. Transportation from the House of Mercy to St.Josephs' House is available for all interested. One Revelation Artist, while making his own art, agreed to let Richmond draw his portrait for a print in exchange. Willie, so taken with his likeness as captured by Richmond, insisted that he wanted to give it as a gift. That portrait, matted and framed, is now a treasured possession of Sr. Grace Miller, proudly hanging in her office at the House of Mercy in Rochester, New York.